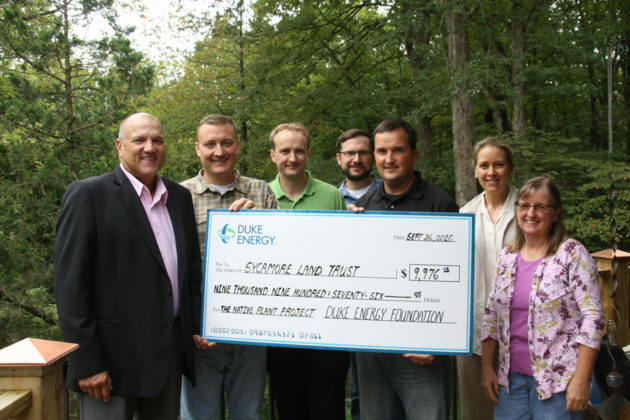 Sycamore recently received a grant from the Duke Energy Foundation for our Environmental Education program. At nearly $10,000, this grant will enable us to expand our successful Native Plant Project, which brings lessons, hikes, and hands-on projects to students of several schools in Monroe and Brown counties. Sycamore staff members accept a grant from the Duke Energy Foundation. The funds will enable Sycamore to expand its Native Plant Project to benefit children in Monroe and Brown Co. schools. Classroom lessons on native plants, animals, and biodiversity are combined with propagating and growing plants, honing scientific observation skills, and actively being in nature. The project also aims to create areas on school properties that will provide wildlife habitat for ongoing learning opportunities, and landscaping design that will reduce the need for mowing. These outcomes promise to benefit the children’s education, as well as their physical and mental health. Studies show that environmental education helps children build skills in observation, critical thinking, and leadership. As part of the Native Plant Project, Environmental Education Director Shane Gibson works with teachers to create outdoor learning opportunities that also incorporate literature, writing, and math to integrate classroom curriculum with the outdoors.